01:10:00 Makes 3 cups cheese spread or 24 servings, 2 Tbsp. (30 mL) each. Makes 3 cups cheese spread or 24 servings, 2 Tbsp. (30 mL) each. This festive appetizer can be made a day in advance. Decorate just before serving. Shape into ball; roll in remaining Cheddar. 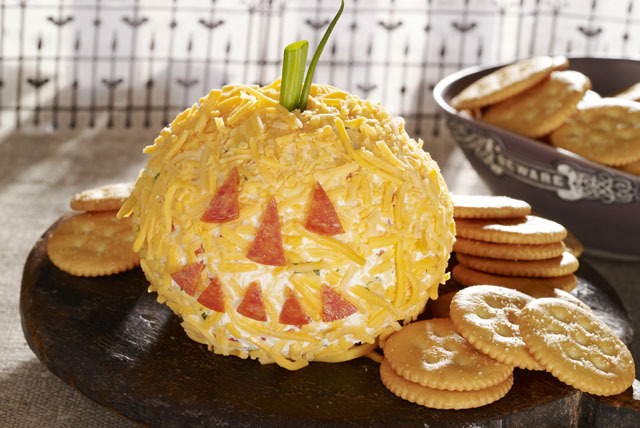 Cut pepperoni into shapes for the jack-o'-lantern's eyes, nose and mouth; press into cheese ball to make face. Insert green onion piece into top for stem. Prepare using Philadelphia Light Brick Cream Cheese Spread and Cracker Barrel Shredded Light Double Cheddar Cheese. Serving Size Makes 3 cups cheese spread or 24 servings, 2 Tbsp. (30 mL) each.